According to ancient Indian traditions Nirvana from the Sanskrit meaning "extinction, disappearance" is a deeply peaceful state of consciousness, undisturbed by dissatisfaction and sorrow. It is mainly associated with Buddhism, which was born out of Hinduism. 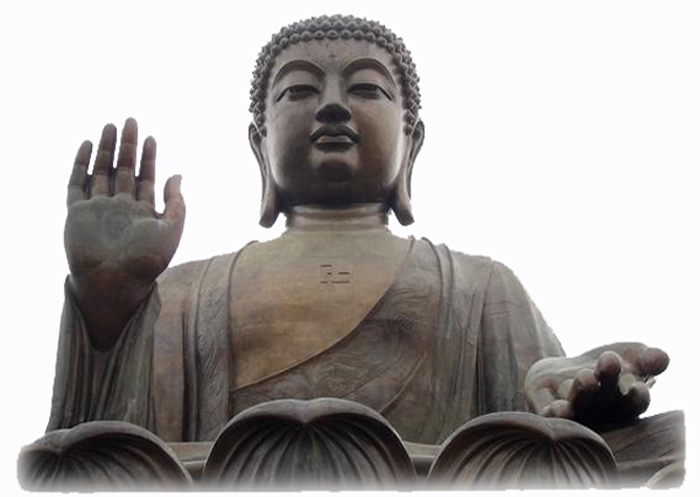 Siddhartha Gautama, who later became the Buddha ("the awakened one"), was born to a rich, ruling family around 563 B.C. in what is now modern Nepal. 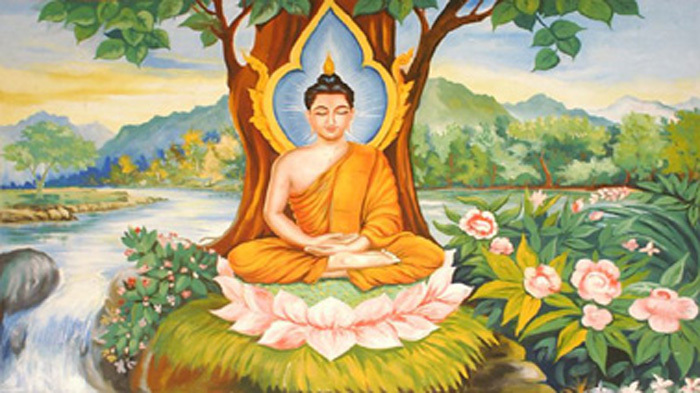 According to Buddhist legend, he led a sheltered, pampered life for all of his childhood and well into his twenties. As a young man, he began to question the worth of this luxurious life and decided to give up all his possessions and emotional attachments, including his wife and young son. In keeping with Hindu thought he wanted to understand the true nature of life and saw all his attachments as distractions. According to legend, as he meditated under a tree, he saw all of his past lives, and then the past lives of others. Eventually he gained enlightenment, a deep recognition and knowledge of impermanence and permanence, time and timelessness, the world and the void. What we call life is "dukkha" unavoidable dissatisfaction and sorrow. At the root of dukkha there is wanting, wishing, hoping, resisting. Liberation from dukkha, from dissatisfaction and sorrow is possible. There is a path that will lead to the end of dukkha. 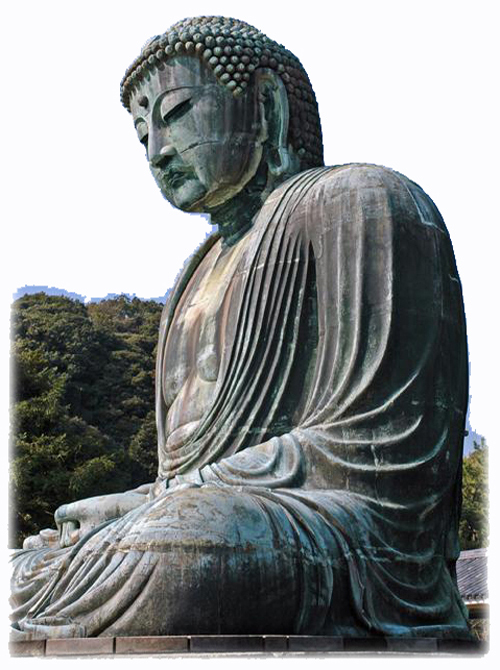 Once Buddha was in a dejected mood as he did not succeed in his Yogic practices. He knew not where to go and what to do. A village girl noticed his sorrowful face. She approached him and said to him in a polite manner: "Revered sir, may I bring some food for you ? It seems you are very hungry". Gautama looked at her and said, "What is your name, my dear sister ?". The maiden answered, "Venerable sir, my name is Sujata". Gautama said, "Sujata, I am very hungry. Can you really appease my hunger?" The innocent Sujata did not understand Gautama. He was thirsting to attain supreme peace and Self-realization. He wanted spiritual food. Sujata placed some food before Gautama and entreated him to take it. Gautama smiled and said, "Beloved Sujata, I am highly pleased with your kind and benevolent nature. Can this food appease my hunger ?". Sujata replied, "Yes sir, it will appease your hunger. Kindly take it now". Gautama began to eat the food underneath the shadow of a large tree, thenceforth to be called as the great 'Bo-tree' or the tree of wisdom. Gautama sat in a meditative mood underneath the tree from early morning to sunset, with a fiery determination and an iron resolve: "Let me die. Let my body perish. Let my flesh dry up. I will not get up from this seat till I get full illumination". He plunged himself into deep meditation. At night he entered into deep Samadhi (superconscious state) underneath that sacred Bo-tree (Pipal tree or ficus religiosa). He was tempted by Maya in a variety of ways, but he stood adamant. He did not yield to Maya's allurements and temptations. He came out victorious with full illumination. He attained Nirvana (liberation). His face shone with divine splendour and effulgence. He got up from his seat and danced in divine ecstasy for seven consecutive days and nights around the sacred Bo-tree. Then he came to the normal plane of consciousness. His heart was filled with profound mercy and compassion. He wanted to share what he had with humanity. He travelled all over India and preached his doctrine and gospel. He became a saviour, deliverer and redeemer. beyond inner conflict and stress. "I am" is clear and strong yet not separate. what needs to be done is done. Kindness and goodwill are unhindered. I was one with everything that ever existed, or ever will be. I knew at that moment, the why of all whys. I had no questions, I had need for no answers. Everything was known in that instant I entered the light. In the place of learning, I knew everything. I saw wondrous meanings everywhere; everything was alive and full of energy and intelligence. The light and love filled every object, whether natural or man-made. I didn't feel alone because I felt unity with everyone and everything. I knew without a hesitation that everyone and everything in the entire universe is connected into one; that we are each a part of everything. I knew that I was eternal. All knowledge poured into me and I knew that everything was ok the way it was and that everything was being loved no matter what it was. I instantly acquired knowledge. I felt my core. I just knew everything intimately, as I was everything. Time and space did not exist. The true nature of the universe was suddenly clear as a bell, like a giant jig-saw puzzle. It seemed to have a perfect order to it. Everything is simpler then I ever thought before. “Out of The Absolute comes The Absolute, and The Absolute remains."